WASHINGTON (CNS) — Concerned that Puerto Rico’s debt crisis is inflicting hardship on poor and middle-class households, Archbishop Robert Gonzalez Nieves of San Juan met with congressional leaders and the White House to push for a resolution. The crisis has led to school closings, cuts in social services and health care and job layoffs and reductions in employee benefits as Puerto Rico struggles to make payments on the $72 billion in debt the U.S. territory holds. “We want to create more awareness of the urgency of the situation in Puerto Rico and the dangers that more austerity measures would create. In terms affecting human lives, especially the poor, we already have approximately 50 percent of our people living under the poverty level and obviously the impact of the current situation is creating unemployment and a new exodus of people,” Archbishop Gonzalez told Catholic News Service Sept. 30 after meeting with congressional leaders. The archbishop and the Rev. Heriberto Martinez Rivera, general secretary of the Puerto Rico Bible Society, met with Rep. Nancy Pelosi, D-California, House minority leader; Sen. Elizabeth Warren, D-Massachusetts; the chief of staff for Sen. Orrin Hatch, R-Utah; and White House Chief of Staff Denis McDonough in a whirlwind tour of Washington political leaders. 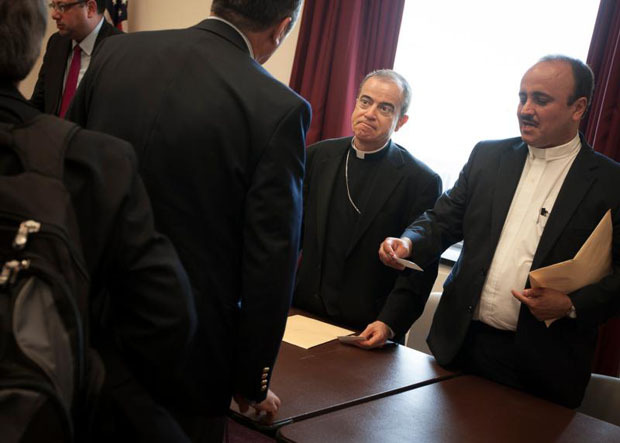 The religious leaders reiterated their pleas during an afternoon briefing in the Rayburn House Office Building. Their message was marked with pastoral as well as political overtones as they explained how a handful of “predatory hedge funds” had purchased debt from investors at pennies on the dollar and are demanding payment in full on the public bonds they hold. They called such actions immoral and a prime example of the “profit-at-any-cost” form of capitalism decried by Pope Francis. In recent months, Archbishop Gonzalez has become increasingly vocal in calling for debt relief. He wrote a column on the issue that appeared in the July 16 issue of Time magazine and has spoken out numerous times since. He also was among 18 religious leaders in Puerto Rico, including four other Catholic bishops, who signed a widely distributed letter calling for the biblical concept of jubilee, or debt forgiveness, for the territory. In the Washington meetings, Archbishop Gonzales said he called for legislation that would allow Puerto Rico to enter bankruptcy or to secure low-interest loans or emergency financing from the International Monetary Fund. As a U.S. territory, Puerto Rico is in a unique situation. It is not governed by the same U.S. bankruptcy laws that pertain to state and local governments, and because it is not an independent nation, it cannot approach the IMF. The two faith leaders also called upon the U.S. government to look into avenues the Federal Reserve can take to restructure the debt without congressional action. Jubilee Network USA and its executive director, Eric LeCompte has been working with Puerto Rican religious, government and labor leaders since July, soon after Gov. Alejandro Garcia Padilla announced that the island cannot pay its debts. A faith-based organization with headquarters in Washington, Jubilee Network USA has helped secure debt relief and refinancing deals for struggling and impoverished nations around the world in line with the biblical principle of jubilee. LeCompte said Puerto Rico is not alone in the Caribbean as other countries are facing the same issues. Grenada recently had its debt restructured despite the opposition of some hedge fund firms. He pointed to Pope Francis’ calls for responsible lending and borrowing on the part of all nations and a global bankruptcy process during his Sept. 25 address to the United Nations. “We know part of the solution is implementing responsible lending and borrowing and public budget transparency, anti-corruption efforts. We know part of the solution is curbing corporate tax avoidance and curbing tax evasion around the world. These are all pieces that need to move forward. They are pieces that need to move forward in Puerto Rico, in the Caribbean and around the world,” LeCompte said. Austerity measures have taken their toll on Puerto Ricans, causing tens of thousands of people to leave the island for the mainland U.S. since 2010. U.S. Census figures show that Puerto Rico’s population declined by more than 177,000 to 3,548,397. Meanwhile, 41 percent of Puerto Ricans lives in poverty in 2014, according to the data. Meanwhile, the U.S. Bureau of Labor Statistics listed unemployment at 11.6 percent in August, down from the peak of 16.9 percent in May 2010. Archbishop Gonzalez said the migration of Puerto Ricans northward affects the quality of family life because members are split between two locations. Any measures to ease the crisis must be undertaken in collaboration with the Puerto Rican people, Archbishop Gonzalez added. Rep. Raul Grijalva, D-Arizona, told the briefing that he and other members of the Congressional Hispanic Caucus have advocated on Puerto Rico’s behalf with little success. A bill allowing the island to declare bankruptcy introduced by Rep. Pedro Pierluisi, D-Puerto Rico, the territory’s nonvoting member of Congress, has gone nowhere, he said. It’s time to end “blaming the Puerto Rican people for the debt and the crisis and forget to look at ways that can help to get out of the crisis,” Grijalva said.